Welcome to the SPC - Musik Drum Pad manual. This site will help you get started with our music creation app. The Scene view is the main page of the SPC Music Sketchpad. By clicking on the pads you start and stop the 16 individual tracks. A set of samples/loops and patterns is called scene. The start and stop button for the whole application. The record button for recording your performance as a wav file. The current tempo of the scene. Click on this button to change the tempo by tapping or typing it in. 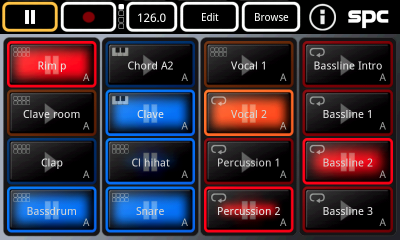 Click on the Edit button to activate the edit mode and choose one of the 16 pads to edit its individual settings. Click on the Browse button to get to the browser page where you can replace the samples used in the current scene or build up new scenes from the bottom. Clicking on the I button will show informations about the current scene. Blue: The pad plays independently. Red pads in one column are stoping one another. Orange: The activated pad will play once. The character in the lower right corner indicates the currently playing variation A, B, C or D.
Click and hold on a pad activates the corresponding volume control. You can open up one overlay for each of the 4 columns simultaneously. 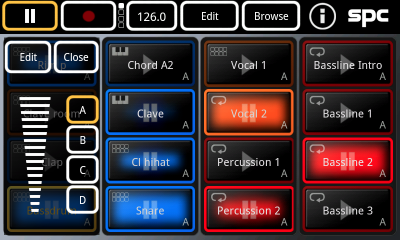 With this feature you can fade in and fade out the sound of the pad, choose one the the variations A, B, C and D, and get directly to the edit mode for the selected pad. In the context menu you will find the Load/Edit and Save scene options. Clicking on Find Scenes will get you to our download page where you will find additional scenes for playing around with in the SPC Music Sketchpad. This screen is available for every of the 16 pads. Here you can determine the behavior of the selected pad. Toggle (Red): Pads in one column are stoping one another. On/Off (Blue): The pad plays independently. One Shot (Orange): The activated pad will play once. Instant: Once clicked the pad will start playing instantly. 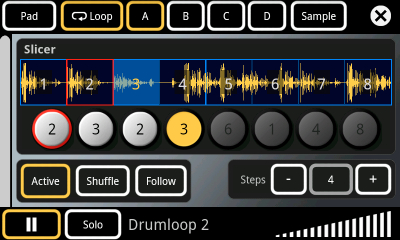 Next Beat: The pad will start playing the loop or sequence at the next beat. Next Bar: The pad will start playing the loop or sequence at the beginning of the next beat. 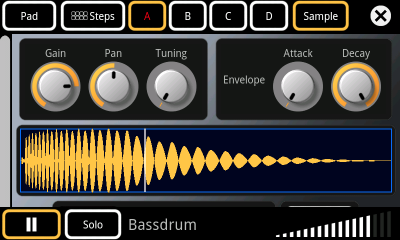 Loop: Choose this for playing the selected sound as a loop. Steps: Play selected sound by setting steps, e.g. a single drum sound. Keys: Play selected sound by setting individual notes, e.g. single piano sound. 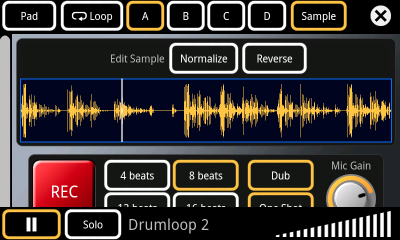 The lower part of the screen shows the waveform of the sample or loop assigned to the pad. 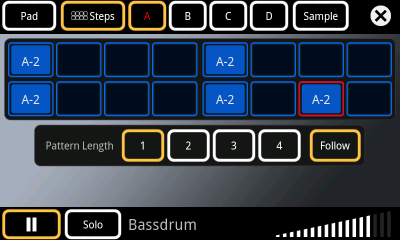 The Steps view is available if you choosed steps as the sample mode for a pad in the Pad view. Select and deselect notes to be played by touching the 16 blue squares. Choose one of the four patterns available by clicking on A, B, C or D in the upper part of the window. Pattern Length determines if only one or up to four patterns are played consecutively. Choose Follow to show the currently playing pattern if the pattern length is bigger than one. In the context menu you will find options for cut, copy and paste patterns. 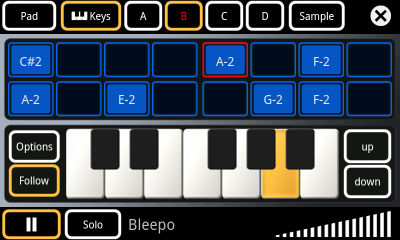 The Keys view is available if you choosed keys as the sample mode for a pad in the Pad view. Select and deselect notes to be played by selecting one the 16 blue squares and by pressing a key on the keyboard. Choose one of the four patterns available by clicking on A, B, C or D in the upper part of the window. 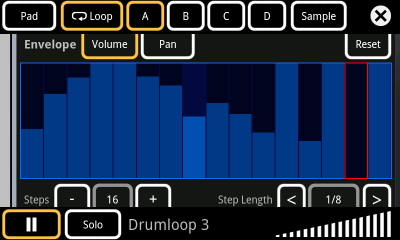 Under Options you can choose the number of patterns played by the pad. If you choose Follow you can enter notes in real-time with the keyboard. Use up and down to transpose notes you have entered by an octave. Change the gain, panning and tuning of the sample with the corresponding knobs and adjust the samples envelope with the attack and decay controls at the right. The display in the lower part shows the waveform of the sample assigned to the pad. Scroll down in the Sample view to get to the recording section for short samples. Pressing on the REC button will start the recording. When On Trigger is activated the SPC will start the recording when the sound you want to record surpasses a certain threshold. Adjust the sensitivity of the input with the Mic Gain knob. 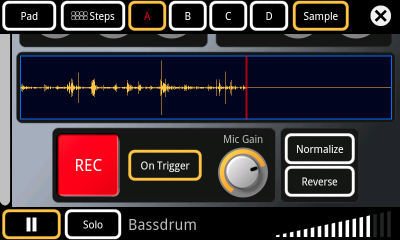 If you are recording a sound in an empty pad, the recording will automatically get the name ‘Recording’. You can change that name in the Browse section. If you are recording a sound in a pad that contains already a sample the sample will be overwritten and the name of the pad will remain the same. All your recordings are part of the current scene and will be saved with that scene. You can use your recordings in other scenes by adding the sounds in the browser view. Just click on a scene in the list on the right side of the Browser view to see all used sounds and add them to your new scene. For adjusting the volume of your audio file to a standard level use the Normalize button. By pressing Reverse you can invert your sample. Use the context menu to get to the calibration window. This feature allows you to adjust the latency between output and recorded signal. The upper part of the loop view shows the slicer section with the waveform of the loop and the automatically generated slices of the loop. Activate the slicer with the corresponding button on the left side. Shuffle sets the step number and the slice order randomly. In the steps area you can set the number of slices to be played. Assign slices to steps manually by first selecting one of the round buttons and by tapping on the number of the desired slice for that position in the waveform. Scrolling down in the loop view gets you to the envelope section. With the volume envelope you can control the sound level for each step of the envelope and with the pan envelope the stereo panning for each step. Both envelopes offer up to 16 steps per envelope. ‘Step Length’ sets the speed at which the envelope will be applied. There is a volume and pan envelope for every of the 16 pads playing loops and they can be adjusted independently for all the four variations A, B, C and D of a pad. The sample view shows the waveform of the loop assigned to the selected pad. 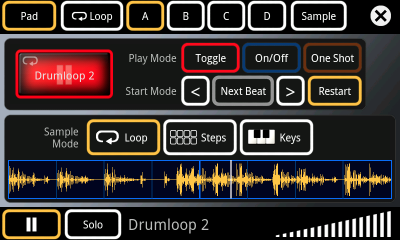 With the Normalize button you can adjust the volume of the loop to a standard level. The Reverse button inverts the current loop. 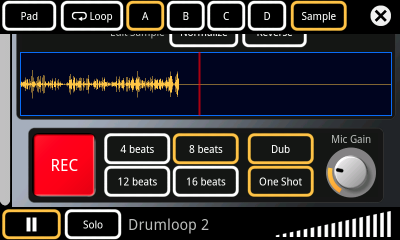 Scroll down in the Sample view to get to the recording section for loops. Pressing the REC button will start the recording. With the four beats buttons you choose the length of the recording. When ‘Dub’ is selected your recording will be recorded over the audio already assigned to the pad. If ‘Dub’ is not selected the audio material will be overwritten. If the ‘One shot’ button is selected the SPC will just record one bar of sound and then stop the recording. If it’s not selected the app will record audio unless you press the REC button again. Adjust the sensitivity of the input with the Mic Gain knob. If you are recording a sound in an empty pad, the recording will automatically get the name ‘Recording’. You can change that name in the Browse section. If you are recording a sound in a pad that contains already a sample the sample will be overwritten or overdubbed and the name of the pad will remain the same. To create your own scenes load your loops and samples into the folder ‘Loops’ or ‘Samples’ on your SD card in the SPC folder. The files have to be in the wav format with up to 24 bit 96 kHz. You can also use sounds from already existing scenes. Just click on a scene with the SPC logo to display the available loops and samples. To arrange your scene select a pad on the left side and an audio file on the right side. Then press load to assign the wav file. Alternatively you can click and hold a file and drop it onto the desired pad. 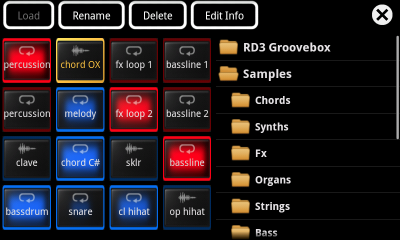 If you have the RD3 Groovebox installed on your device, all the loops you created and exported as audio with it will be shown in the RD3 Groovebox folder for instant use in your scenes.